Iran’s semi-official Fars Newsagency published a fake photograph on Sunday 18th February, that purports to show US-manufactured ammunition had been supplied to the Balouchestan bombers – and by implication, the US supported the bombers by supplying them with weapons. 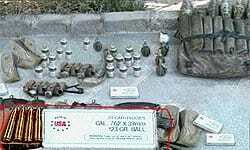 TEHRAN (Fars News Agency) – Following a Saturday report about the use of US manufactured weapons in the recent terrorist operations in Iran’s southeastern province of Sistan and Balouchestan, a security official provided FNA with a photograph of the said weaponry. These arsenals have been confiscated during a raid on the hideout of a terrorist group known as Jondollah in the provincial capital city of Zahedan on Thursday. Today, the Fars News Agency reported that Deputy chairman of the Iranian parliament’s National Security Commission said the agents in charge of the terrorist blasts in Iran’s southeastern city of Zahedan enjoyed the United States’ support. Detective work by bloggers in the US resulted in the discovery that the “confiscated arsenal” photograph was actually a fake, created by copying weapons components multiple times. See the flash movie created by Dar Ul Harb, that shows how the photograph was fabricated. It is not clear if the “security offical” who provided the photo was a fabrication and the “evidence” was created by FARS or known to be fake by FARS. There is no way to tell id the “security official” was involved in the fabrication. In any case, the fake photograph appears to have fooled the Deputy chairman of the Iranian parliament’s National Security Commission. Photographic evidence is becoming more difficult to trust, but luckily, there are many tell-tale signs on this particular photograph (see above). Over time, it will become more difficult to trust what we see in photographs and videos. Ed: Media must check sources more thoroughly. The race to be the first to cover a story needs to be tempered with the need to be right – or at least reasonably sure the information is correct and the source reliable.